HostelBookers invites you to explore the beaten path outside Stockholm by taking day trips to Uppsala, Västerås and Drottningholm, writes Madeleine Wilson. Once you have explored all of Stockholm's attractions and followed the other sheep around the idyllic archipelago, turn your attention west to the historic cities on the shores of Lake Mälaren. All under an hour's journey from Stockholm, the bustling student town of Uppsala, the cobbled streets in Västerås and the royal activities at Drottningholm make for great day trip destinations a little off the beaten tourist path. Alternatively, try the peaceful Millesgården sculpture garden to the northeast of Stockholm with wonderful views and artwork by Carl Milles. 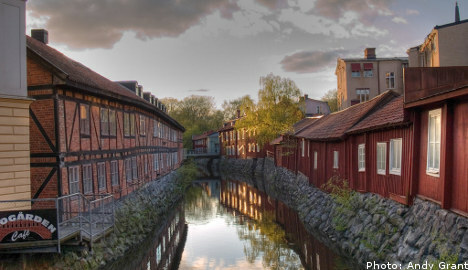 Uppsala is Sweden's answer to Oxford. The city offers striking and well preserved historic buildings, but as a university town, the student population keeps the city lively. The Domkyrkan cathedral dominates the medieval town centre, although the rather drab exterior, which has been brutally stripped and rebuilt with 19th-century add-ons, does no justice to the glorious spectacle inside. Many of the surrounding buildings have kept their architectural and historical charm and house small collections of antiquities and even an anatomical theatre from 1663. Sadly, much of the castle was destroyed in 1702, but the nearby Skokloster Castle more than makes up for Uppsala's slight fortification shortfall. On the east side of the Fyrisan, a river running through the town, you can soak up the bohemian student atmosphere along St Olofsgatan or Bangårdsgatan. For a few budget eats, try Saluhallen on St Eriks torg. At the popular Svenssons Taverna, you can sit outside on the colourful terrace or dine inside by candlelight and enjoy international dishes. The nightlife evolves around "Flogsta" dances, gigs and parties located in the student "nation" houses. You're supposed to be a Swedish student, but get talking to people, especially around the cafe at Upplands Nation, which is open until 3am, and a few doors should open for you. Alternatively, Katalin and All that Jazz are located in a former railway goods shed and are less student-oriented. The town is buzzing around the time of the Uppsala Reggae Festival held from August 5th to 7th. Getting there: The journey takes about 40 minutes and trains leave Stockholm twice an hour. The boat is a leisurely option, but you will be travelling for most of the day. to check out Uppsala's nightlife, you may want a place to crash. Book a private or shared room in an Uppsala hostel. Start at the tourist office and pick up a few "What's On" pamphlets, then stroll up Köpmangatan to the cobbled squares of Bondtorget and Stora Torget. The Svartån river runs through the city centre and crossing at the Apotekarbron bridge offers wonderful views of little wooden cottages hugging the banks of the river. overhanging veranda which is perfect in summertime. Be sure to keep an eye out for the many modern sculptures dotted around the town. The city has over 300km of cycle tracks and is well suited to cyclists, so you could consider hiring bikes for the day. Behind the cathedral is the quaint Kyrkbacken district. You can meander through hilly cobblestone streets and well preserved wooden cottages that once housed 18th-century bourgeoisie artists. Twenty-four floors up in the Radisson SAS Plaza Hotel is the magnificent Sky Bar, where you can enjoy views of Lake Mälaren and the forests surrounding Västerås. Don't forget, in summer it stays light until about midnight, so the city feels safe and relaxed well into the evening. Stroll down to the harbour and dance to some live jazz and blues hosted at the Village Bar. If you like to swim, the nearby island of Östra Holmen has three excellent beaches with wide-open views of Lake Mälaren and is popular with locals. If you'e visiting the last weekend of August, you can catch the arts and crafts market and take in its festive atmosphere. Getting there: You can reach Västerås by train from Stockholm in under an hour. Crown Princess Victoria recently celebrated part of her wedding to Daniel Westling at the UNESCO-listed Drottningholm Palace. The royal residence stands on the shores of the island of Lovön, with sweeping views across the water and is less than an hour from Stockholm by boat. Tessin, a father and son architect duo, favoured French designs from the 1600s, which has led to tiresome comparisons with Versailles, though the Swedish version is much smaller. Getting there: It's a wonderful 50-minute journey by boat departing hourly from Stadhusbron, but if you already have a Stockholm Card, the T-bana to Brommaplan, followed by the 301 or 323 buses will take you there. greatest sculptors and collectors, Carl Milles. The house is perched on the cliff of Herserud, high above Lake Värtan. Over time, the estate has acquired adjoining properties and land. Carl Milles also dabbled in garden architecture and cut a number of terraces out of the cliff face, constructed a marble arch entrance, columns and monumental stairways. He was inspired by the gardens of Mediterranean Italy and commissioned a number of frescos to decorate the loggia. Rosenterrassen. On your trips to the archipelago, you may notice a sculpture at the entrance to Stockholm Harbour: a curved piece of steel with the figure of a boy balancing on the edge. This is also by Milles. Getting there: Take the T-bana to Ropsten, then bus 207 one stop to Torsvik. Alternatively, from Ropsten, catch the pretty Lidingö train for two stops to Baggeby. If you want to save your kronor for exploring the nightlife, daytrips and cultural visits, why not stay at one of the many hostels in Stockholm, where you can book either private or shared rooms. This article was produced by The Local and sponsored by HostelBookers.